Longtime doodler Josh Scheuerman is always in search of a creative outlet, whether that be skateboarding, snowboarding, graphic design or, more recently, painting. 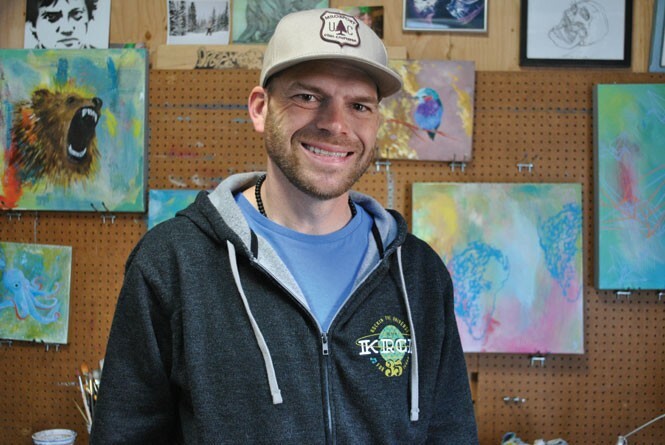 Scheuerman founded the Art Adoption event with the goal of finding homes for his and other local artists' work, and creating a positive community event. This year's winter Art Adoption is at Photo Collective Studios (561 W. 200 South) on Saturday, Dec. 13, from 7 to 11 p.m., and will feature paintings, prints, jewelry, cards, pottery and other items made by local artists. The event is partly in benefit of a local couple looking to adopt a child—each artist has been asked to set aside one piece of work, the proceeds from which will go directly to the couple. For more, visit Facebook.com/SLCArtAdoption. Why does the Art Adoption exist? I started painting six years ago and found out fairly early on that there’s nowhere to sell the art that you create. You either have to go to restaurants or coffeeshops, where most people think of it as decoration with price tags; people don’t really think, “Oh, I’m going to get that.” It’s really hard to get your art out there in the world, on gallery stroll, or have a group showing. So I came up with the idea that I was going to have my own party, and invite other artists, and create an event with the intention of having a place for artists to sell art. We had it in a friend’s outdoor garage space for the first one, and had ourselves a party. A lot of artists that were selling art were just turning around and buying other people’s art, which was really nice to see, because we were just starting to meet other artists who were in the scene here. And it’s grown over time. I think the first one we had about eight artists, and this adoption, we have 40. Why does art need to be adopted? The reason it was called Art Adoption is that they’re orphans. You maybe sell two or three pieces per show, and then you end up with the rest of them that you don’t know what to do with. Once you show a piece once or twice, you don’t want to show it anymore. I had some orphans lying around as well and was trying to figure out how to get rid of them. You put money and time into them, so it’s hard to not do something with them. What’s the value for artists? Some of the most recognized artists in the valley are involved in this [Sri Whipple, Trent Call], and then it’s some artists’ first show. It can be intimidating to be with these well-known artists, but to get to a gallery stroll showing, you have to have some connections, and be really, really, really good at what you do. And most people don’t build up enough confidence in themselves and their art. Just being able to show it once or twice may build them up enough to pursue it. It’s a chance for them to meet other artists, as well. There’s a collaborative effect that goes on, with the artists meeting each other, and the public being able to go hang out with the artists as well. Beyond shoulder-rubbing with local artists, what are the perks for the public? I tell artists to bring stuff that they want to let go of, and let go of in a way that is responsible for them financially, but also gives people incentive to take it home with them. I encourage print-makers to have price points in the lows and highs. I tell people that up to $80 is pretty negotiable; after that, people got to really like the stuff. It’s really easy to go to Target and Anthropologie to buy art or cards, or to Ikea and buy an $80 reprint of an iconic image. But you can get local, awesome art for the same price, or less. What’s the donation aspect of the event? Friends of friends of friends are trying to adopt a child. And I didn’t know this, but adoptions are hugely expensive—like $30,000 expensive. So we’re trying to cover the adoption. It’s a community event; I take just enough to cover the [credit-card processing] fees, and artists get 95 percent of the money from what is sold. The cash-bar money and donations go toward a different nonprofit each time. This one is interesting in that after six years of the Art Adoption, we’re raising funds for a human adoption. It’s kind of come full circle. It’s going to bring attention to their plight but also to adoption in general. We always ask for canned donations and nonperishable food, and that goes to the Road Home. And clothing donations we send to Volunteers of America’s youth resource center. What’s the status of Salt Lake City’s art scene? I’ve been blown away with all the artists that are involved. I think the art scene is expanding. There’s the new art space over in the Granary District, and Poor Yorick is on West Temple. Sugar House is rebuilding itself; the gallery stroll is happening over there. The ones downtown are happening. Our artists are in Juxtapoz, they’re on blogs, they’re doing San Francisco shows. UMOCA does an incredible job. Even boutiques are showing local artists. It’s more a collective—artists, musicians and business people who are in our early 30s or mid-30s who are actually changing the scene now to what it could be in the future.